"I have been fortunate enough to work with Brad on my comedy writing and performing for the past several years. His helpful insights and mentoring have helped me far beyond the stage. I think of him as one of my secret weapons for business success." 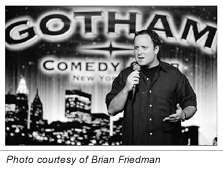 Brad Trackman, a 21-year veteran comedian, is a regular at every major comedy club in NYC, with numerous national television credits as a featured comic. Trackman is considered a leading authority in teaching, lecturing, and privately coaching stand up comics at every level. 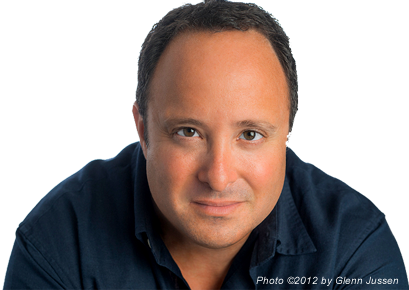 He began teaching at the American Comedy Institute for 5 years alongside his first teacher, Stephen Rosenfield. Incorporating many of Stephen's core philosophies, Brad put a contemporary twist on them, developing a unique method of teaching stand up from a comic’s perspective. Brad then opened The Philadelphia Comedy Academy at Philadelphia’s Helium Comedy Club, which has become one of the nation’s most successful stand up comedy programs. Many of Brad’s students have made national television appearances, including debuts on Comedy Central and The Tonight Show with Jay Leno. For the past five years, Brad has been teaching stand up at the prestigious Ivy league University of Pennsylvania/ Wharton School of Business. He has been conducting a natinoal seminar, Comedy A thru Z, to amazing reviews at numerous venues, such as The DC and Hollywood FL Improv, Hilarities Comedy Theater, and the Punchline in San Francisco. Brad has made his lecture and comedy coaching universal by traveling abroad to Holland, England and Canada. He does consultations with comics around the world with Skype. Trackman also has worked with presidents of Fortune 500 companies, motivational speakers and individuals from all walks of life who want to incorporate humor into their public speaking skill set. MTV recently chose Brad to train the cast of The Buried Life how to do stand up comedy. Trackman and former executive producer Rick Delgado of Opie and Anthony are currently developing a reality show based on Brad’s teaching, appropriately titled, The Joke Whisperer.